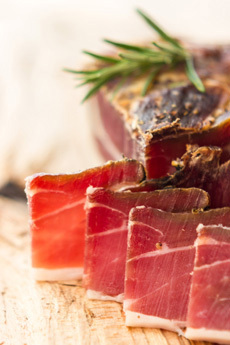 Speck has been mass produced for some time, but if you seek out the name-protected Speck Alto Aldige, you can take a bite of a ham that dates back to 1200 C.E. 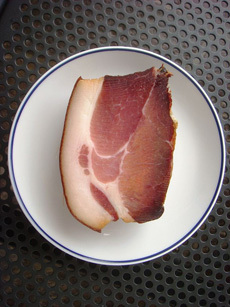 (although the modern word “speck” first appeared in the 18th century*), and is still made with time-honored techniques. Lightly infused with seasonings and smoke, Speck Alto Adige has a distinctive, natural taste, with balanced flavors and delicate aromas—bits of herbaceousness, smokiness and sweetness. Thick slices of speck. Pour a glass of red wine and enjoy! Photo by F.P. Wing | IST. Thinking back to our first experience, we asked around; only our wine editor had the correct answer. Since that day at Otto in 2001, we’d encountered speck on menus, often called “speck prosciutto and “Tirolean prosciutto.” No doubt the proper name, Speck Alto Aldige, would be more confusing. No wonder most people are confused (if not entirely ignorant). Another factor is that we didn’t grow up with authentic speck. It’s only in the last decade or so that it’s been imported into the U.S. True Speck Alto Aldige, IGP (Protected Geographical Indication, bestowed on products that can trace their roots to the 15th century) is a distinctive artisan product, a culinary delight, and something you should get to know. So what’s the difference between speck and prosciutto? Speck Alto Aldige is made from a deboned hind thigh using four ingredients: salt, an herb and spice blend, smoke and air curing. Because of the light smokiness, you can substitute it for [the more heavily smoked] bacon. For a true foodie experience, get some of each for a taste test. Use it as an occasion to open one of your finest Italian reds. The result of centuries-old, finely-honed proprietary production techniques and the unique terroir of the Alto Aldige/South Tirol, Speck Alto Adige can only be made in that region, with the old artisan techniques (more about them below). Check out the speck recipes at Speck-Alto-Adige-Recipes.com. To guarantee the quality and authenticity of Speck Alto Adige, the trade association Consorzio Tutela Speck Alto Adige and the independent control institute INEQ (Istituto Nord Est Qualità) verify compliance with the quality parameters throughout all phases of production. Inspectors may visit the production sites at any time to be sure controls are being met. Only those hams that meet the stringent production criteria are fire-branded with the Speck Alto Adige seal, as proof of their quality and authenticity. Production begins with the selection of pig breeds with a strict fat/lean ratio lowers the cholesterol in speck, compared with other types of ham. The finest, lean thighs (hams) are then seasoned flavored with the producer’s proprietary blend of aromatic herbs and spices, including salt, pepper, juniper, rosemary and laurel. They are dry-corned or cured for three weeks at controlled temperatures, and are turned periodically so the corning evenly permeates the meat. The final salt content must not exceed 5%. The hams are then exposed alternately to smoking and drying. The smoking phase is light, done over low-resin wood to provide a pleasantly mild flavor. Finally, the smoked hams are hung to dry in rooms infused by the clean, fresh air of the South Tyrolean mountain valleys. The aging period, based on the weight of the ham, lasts about 22 weeks. During this phase, the hams lose part of their initial weight and acquire their characteristically firm consistency. It’s a special food for a special occasion, and certainly will be a point of interest in entertaining. If you can’t find Speck Alto Aldige in a local specialty foods store or Italian market, you can buy it online. You can also get to know other types of speck. A cousin of the Italian original, La Quercia in Iowa makes a nice “American” speck, but it’s as distant a relation to Speck Alto Aldige as domestic Parmesan is from Parmigiano Reggiano. You can also find Black Forest Speck from Germany and Gailtaler Speck from Austria. Some Jewish delis sell a beef product called speck that is made from beef. Eliminate any confusion and try to find Speck Alto Aldige. As with anything, go for the best. Bargain brands usually represent bargain flavors; and when people tell us that they don’t like this or that, we suspect it’s because they’ve tried a lesser brand.